Twitter is teaming up with the World Jewish Congress (WJC) to raise awareness about the danger of genocide and all forms of antisemitism, hatred, and xenophobia, by taking a central role in the WJC’s #WeRemember campaign and bringing Holocaust education to a new digital frontier. As part of WJC’s #WeRemember campaign, tens of thousands of participant photos will be live streamed at Auschwitz Birkenau January 23-27. As part of its partnership in the campaign, Twitter supported the WJC in promoting #WeRemember content to social media users and created a unique “emoji” to accompany the #WeRemember hashtag used by the participants. Levy’s testimony was followed by a panel discussion on ways to combat hate both online and off. Notable panel participants included former neo-Nazi and public advocate for dismantling white supremacy, Shannon Martinez (@_Shan_Martinez) and Assistant Professor at Law at St. John’s University Law School, Kate Klonick (@Klonick), and Kenneth Stern, Director of the Bard Center Study of Hate. 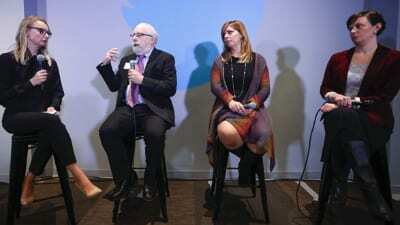 Twitter CMO and Head of People Leslie Berland (@leslieberland) and WJC CEO and Executive Vice President Robert Singer also took part in the discussion, which was moderated by Lisa Roman (@lisaroman), a member of the Public Policy team at Twitter.